"It takes very little to govern good people. Very little. And bad people can’t be governed at all. Or if they could I never heard of it." Interstate 10 leaves Los Angeles due southeast past Palm Springs and Coachella Valley, which enjoy hot, dry climates mitigated by mountains, palm trees, and money. As green disappears from the landscape and the hills take on a reptilian quality, the desert opens up in an arid expanse. There, despite an unbarred sun that beats down year-round and precipitation levels that average point-zero figures, the twin communities of Slab City and Niland can be found near the eastern shore of the Salton Sea—a shallow, toxic lake, approaching ecological disaster. In these difficult and isolated conditions, where the modern urban world seems almost like a fantasy and the weather seems personal, a kind of outlaw ethos prevails in one community, while the other pursues incorporation. Like in every western, it seems the struggle between them concerns conflicting orders of governance, and conflicting assertions of freedom. Slab City, by its own estimate “the last free place in America,” is part homeless camp, part hippie commune, part anarcho-autonomous group, part artist enclave, and part squatter community. And the descriptors are all true. It’s home to war vets, artists, drifters, stoners, tweakers, “dirty kids,” and lots of self-proclaimed weirdoes. They’re united because they have all dropped out of the striated grid of American society, whether by acts of resistance—reaction to the yoke of bourgeois lifestyles, for instance—or by dire necessity. Formerly a World War II barracks called Camp Dunlap, Slab City takes its name from the concrete foundations that were left behind after the Marine Corps abandoned the area in 1965. 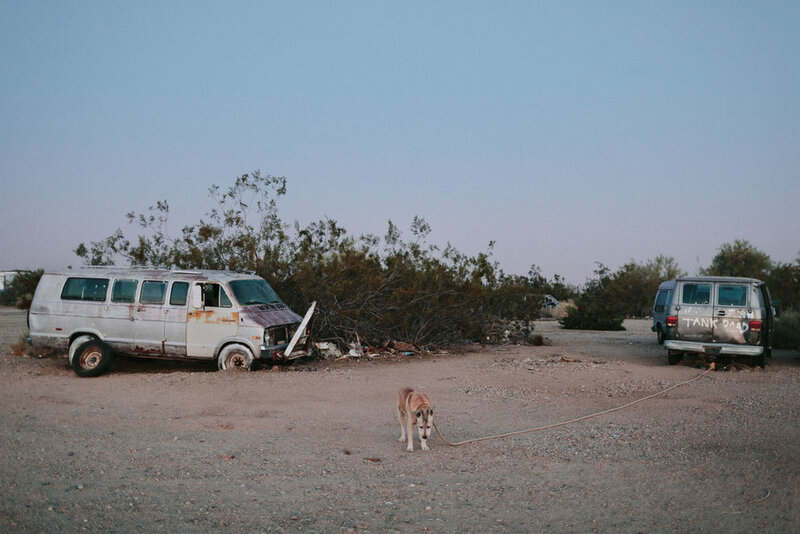 Considered to be commercially useless, the roughly 500 acres that Slab City occupies have been ignored by its absentee landlord, the California State Land Commission, for the past five decades. In a government-oversight vacuum, a community of about 150 perennial residents (and up to 3,000 peregrinating snowbirds, tourists, and transients) live and squat free, albeit without power, sewerage, or sanitation services. The resulting landscape is imbued with truly remarkable flourishes of beauty—and post-apocalyptic flashes, too. Either the sublime emptiness of the place or something in the water seems to be a philter that seduces people into staying. “Don’t drink the water!” is actually a common refrain around these parts. Out here, there is the suggestion that you don’t have to go back to where you’re from. None of it matters. Society is optional. How many “Slabbers” are here by preferred choice rather than Hobson’s choice, though, is hard to say. “I got priced out of the way we are supposed to live,” confides Trish, a former nurse in an intensive-care unit. 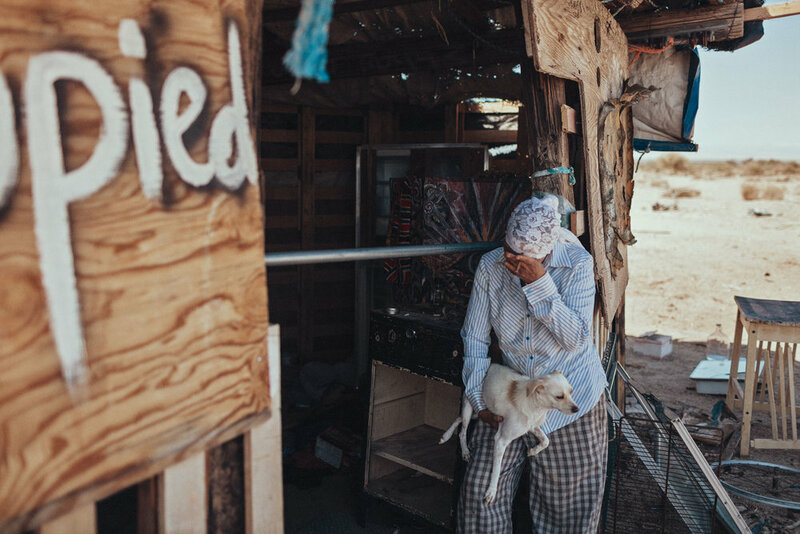 Unable to afford retirement, she settled in Slab City “because it’s free.” Her patch of land was, to her, an embarrassment of riches that afforded her all the time in the world to fix it up or just read a book. Such consequences can be surprisingly many in a place of precious little. Everything—belongings, encampments, food—is fair game if it has been abandoned for five days. Such is the custom. What other people have left behind in the dirt is “ground score,” Trish explains. Searching for her plates, she lamented that someone must have stolen them. Theft is an annoying but endemic part of life in a community where a lot have very little. When simmering tensions reach a boiling point, they’re dealt with through a punitive rite called a “burnout,” where—once it is collectively agreed that a member can no longer be tolerated—their encampment is surrounded and ceremoniously torched. Blackened vehicular skeletons all around serve as evidence that this incendiary extrajudicial process is no joke. Perhaps a more insidious threat to the civic order of Slab City is the perceived gerontocracy that is some feel divides the community along generational lines. In recent years two moneyed organizations (Slab City Community Group and Salvation Mountain Board) were founded in the interest of enhancing resources and furthering restoration work on Leonard Knight’s Sisyphean masterwork, Salvation Mountain, but the introduction of any official organization whatsoever is considered by many to be an affront to the community’s horizontal power structure. Some of the younger inhabitants believe the elder, more influential members of the community are conspiring to purchase the land on which Slab City sits and impose rent and other formalities. And as the government does indeed gear up to sell the land, those with links to the local authorities see little other option. On the surface of things, the underlying moral code might seem inspired slightly more by Mad Max than Karl Marx, but occasional primitivisms notwithstanding, Slab City is still an admirable model of informal self-organization based on principles of inclusion. Whatever the myriad reasons that propel people to Slab City, or condemn them to it, for the most part people get along. Every Saturday night at The Range, a Wes Andersonian concert stage of painted buses, everyone—Goth transvestites and guys with telltale buzz cuts from Camp Billy Machen (a Navy SEAL desert-warfare training facility nearby) alike—shows up for the party. Regular acts include Billy Fly, a retired sheriff, hang gliding world-record holder, and accomplished bongo player; and Randall, a soft-talking Texan with a fondness for western ballads and Mexicali hookers. Everyone except for the Nilanders, that is. “[They] don’t come for the party, thank God,” says Builder Bill, the unofficial mayor of Slab City. “They just come to start fights. In town, they think we’re just a bunch of freeloaders, but the people there are no better.” Barely three miles down the road, the township of Niland asserts its independence from Slab City, as does Slab City from Niland, despite their inalienable proximity and inarguable co-dependency. Niland relies on commerce from Slabbers and the weekend tourists and rubberneckers that pass through on route to Slab City and Salvation Mountain. In turn, Slabbers rely on Niland’s nearby infrastructure for vital supplies such as water, groceries, propane, and Coors Light. Hanging on to an agricultural tradition that was once a backbone of America’s breadbasket, the mostly Hispanic and Latino population of Niland is besieged by all the attendant problems of a struggling economy and declining population. In the early 20th century, isolation, weather, and difficulty adjusting to irrigated desert farming persuaded many homesteaders to vacate the land and hire black and Asian tenants, who migrated to Niland in immense numbers. Hard-working Filipinos arrived after WWII to what was then known (at least locally) as the “tomato capital of world.” Then, in successive declensions, the jobs dried up, the younger generation moved on, and the older generation passed away. Swaths of town opened up as Section 8 housing and drug abuse became real. Loretta, who has lived in Niland her whole life, remembers the better days, before import tariffs were lowered and the influx of Mexican tomatoes decimated the local industry. As if she were reading a passage from Steinbeck, she recounted how her siblings followed the grape harvest up north, married, and moved to other parts of California. Across the road at the Buckshot Deli and Diner (the only eatery in town), Kristen, a young mother of three and an employee of a solar-panel company, sighs as she observes that people in this town don’t seem to want to work. The disparity between those working for an income and those depending on social-welfare checks seems to be a source of friction for locals working hard to make ends meet while others capitalize on subsidized housing and pay next to nothing in rent. By the same measure, the free lifestyle enjoyed by Slabbers can be hard to reconcile. In 2015, tension over Slab City’s use of Niland’s water spigot culminated in a heated debate at the Chamber of Commerce. Now a sign (largely ignored) hangs next to the tap limiting its use to local ratepayers. Driving through town, much of which appears to be succumbing to the laws of entropy, it’s hard not to feel that both Slab City and Niland are haunted in different ways by ephemerality. As California faces formidable water challenges, the policies that govern land use and water access are moving toward prioritizing urban use. Without necessary allotments of the Colorado River to feed its thirsty farms, Niland and the greater Imperial Valley face dire prospects. The fate of the Salton Sea also hangs in the balance—and with it, the health and livelihood of the people that live at its perimeter. The complex economic, social, and cultural conditions that allowed these two communities to flourish in their own way at different times are as endangered today as the Desert Pupfish—the Salton Sea’s only native fish species. In a reductive way, they’re even threatened by the same processes: water diversion, pollution, and habitat modification. As aerial bombs pelt the Chocolate Mountain range in a live-fire gunnery practice, Rebecca Solnit’s cry comes to mind—that this country seems to be in an iron age of both homeland security and homelessness. Among all this vastness and all this power that appears to give this country its identity, there are still pockets at war over the basics: access to water, food, jobs, and shelter. The outlaw existence we celebrate in Slab City is a small stem of a larger partition in American thought that celebrates the primacy the individual in society. But for all of its liberties and maybe its paranoiac autonomy, could Slab City exist without Niland—or the state of California? Can freedom ever come for free?